Microbial keratitis is an important cause of avoidable monocular blindness in India. Young adults in their prime working age group are most commonly affected and hence the loss of man years of productivity is extremely high. The therapeutic results are less than satisfactory even in the most optimistic situations. Even the so called successfully treated cases end up with a corneal scar which might impair vision. The cost of treatment is compounded by the long treatment schedules and frequent follow ups to the hospital A significant percentage of patients fail medical treatment, and will require corneal transplantation. The availability of donor corneas in India is extremely low. Currently only 5% of the requirement is being met. Under these circumstances, it becomes very clear that adequate and appropriate therapy at all levels and more importantly preventive strategies at the primary level will go a long way in preventing this unnecessary catastrophe. A theoretical definition of a corneal ulcer is a loss of the overlying epithelium with underlying infiltration. However, for all practical purposes, microbial keratitis includes any condition which causes suppurative infection of the cornea. Further progress of the disease can cause necrosis of the deeper stromal tissue, resulting in perforation and loss of intraocular contents. It is an extremely common condition causing significant ocular morbidity in our country. In fact, an editorial in the British Journal of Ophthalmology called it as an silent epidemic. Gonzales et al found that the annual incidence of corneal ulceration in Madurai district in South India was 113 per 1,00,000 people. By applying the 1993 corneal ulcer incidence rate in Madurai district to whole of India, about 8,40,000 people are likely to develop a corneal ulcer in a year. Even this figure is quoted as an under estimation when compared to other SAARC countries. This figure is thirty times more than the number of corneal ulcers seen in the United States. Corneal ulceration secondary to Vitamin A deficiency in children. 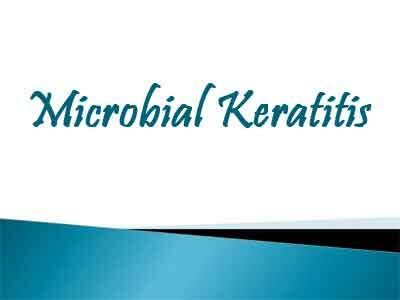 Avoiding exposure to predisposing factors may minimize the risk of microbial keratitis. The majority of corneal ulcers follow trivial corneal abrasions. The use of traditional eye medicines (TEMs) is an important risk factor for corneal blindness, since they are often contaminated and provide a vehicle for the growth of pathogenic organisms. The common TEM’s used in our country includes breast milk, castor oil and leaf extracts. Training traditional healers in asepsis, banning harmful medicines and directing patients to appropriate health care facilities would be the first rewarding approach in preventing corneal blindness due to red eye and corneal injuries. Ocular surface disease such as Trachoma, dry eye, lagophthalmos and Vitamin A deficiency should be treated. Routine use of prophylactic topical antibiotics in this setting is controversial because their efficacy has not been established and may promote growth of resistant organisms. Even though keratomalacia is rare, still we see children going blind due to Vitamin A deficiency. Proper diet counseling and Vitamin A supplementation will totally eradicate keratomalacia from our country. An adequate history taking, coupled with a comprehensive evaluation goes a long way in establishing a clinical diagnosis which can then be confirmed by microbiological examination. Patients come with varying degrees of pain, photophobia, watering and redness of eyes and may also complain of defective vision, especially if the visual axis is involved. Eliciting a proper history with regards to nature of trauma and use of TEM is crucial step in the management of microbial keratitis. Trauma with vegetable matter such as paddy husks or onions are more likely to cause a fungal keratitis. Contact with contaminated or brackish water is likely to produce Acanthamoeba keratitis. In cases of contact lens wearers, it is imperative to take history of wearing schedule and lens care. The ocular examination includes recording visual acuity, an external eye examination and slit-lamp biomicroscopy of affected and normal eye. Due to acute infection of the involved eye, it is difficult to record visual acuity accurately. However, an approximate visual acuity with or without optical correction will give a baseline data to aid in the appropriate management strategy and also to monitor the healing process. Eyelid margins: Inflammation, ulceration, eyelash, and abnormalities including trichiasis, irregularities, and lacrimal punctal anomalies. Conjunctiva: Discharge, inflammation, morphologic alterations (e.g. follicles, papillae, cicatrization, keratinization, membrane, pseudomembrane, ischemia, and foreign bodies). Sclera: Inflammation, (e.g. infectious, versus autoimmune), ulceration, scarring / thinning, nodules, ischemia. Fluorescein (or, occasionally, rose bengal staining) of the cornea is usually performed and may provide additional information about other factors, such as the presence of dendrites, pseudodendrites, loose or exposed sutures, foreign body, and any epithelial defect. Clinical features suggestive of bacterial keratitis include dense suppurative stromal infiltrate with distinct edges and edema. The symptoms are typically more prominent than the signs. Fungal keratitis presents with dry raised surface and feathery indistinct margins. Accompanying satellite lesions may be present in few cases. Acanthamoeba keratitis usually presents with a ring shaped stromal infiltrate, as a late clinical feature and commonly it is misdiagnosed as viral keratitis. It has to be emphasized however that all these features are only suggestive of the organism and microbiological confirmation should be sought for proper identification. While characteristic clinical features have been described for ulcers caused by different microorganisms, it is difficult to confirm these, especially after the disease has become well established. Patients present late in our country and by this time, the clinical demarcation between the ulcers caused by bacteria and fungi are usually lost. Since bacteria and fungi cause an almost equal proportion of keratitis in our country, it is highly essential to perform at least a smear test before initiating the treatment. Corneal infective material is obtained by scraping after instilling a topical anesthetic agent (4% lignocaine) and using a flame sterilized platinum spatula, blade or other similar sterile instrument. The material is obtained from the advancing borders; ulcer base and edges. 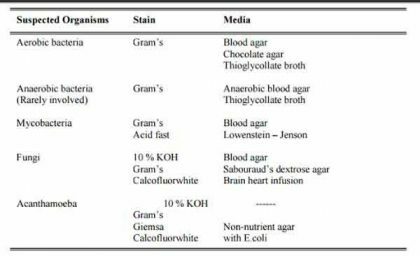 Two smears are initially prepared – one with Gram’s stain (for identifying bacteria, fungi, and Acanthamoeba) and the other with 10% potassium hydroxide (for fungus). Biochemical investigations: A baseline evaluation for diabetes mellitus should be performed. Some of these patients have undiagnosed diabetes, which might hinder with the healing of the ulcer. The treatment for suppurative keratitis is often prolonged. The importance of a regular follow up should be adequately emphasized to the patient before the initiation of the appropriate anti microbial therapy. 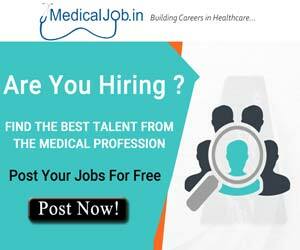 A careful counseling of the dosages of the individual medicine should be adequately explained to the patient and an accompanying person so that it will be applied in the right manner. The treatment strategy should be guided by the microbiological investigations and the clinical appearance of the ulcer. For severe keratitis (ulcer more than 5mm and deep), a loading dose at every 5 to 15 minutes during the first hour, followed by applications every 15 minutes to 1 hour during waking hours is recommended. It is ideal to treat the patient as inpatient. For non-severe keratitis, a regimen with less frequent dosing is appropriate. Cycloplegic agents may be used to prevent synechia formation and to decrease pain. Small ulcers less than 2 mm and away from the visual axis do not need cycloplegics. Gram positive cocci are the most important cause of bacterial keratitis in our country. Topical eye drops of Chloramphenicol (0.5%) and Cefazolin (5 to 10%) are ideal for gram positive cocci. S. pneumoniae, which is the most common bacterial isolate in our country, has variable susceptibility to fluoroquinolones and hence fluoroquinolones may not be the ideal antibiotic for monotherapy for gram positive organisms in our country . Gram negative bacilli respond very well to fluoroquinolones and aminoglycosides. Single drug therapy using a fluoroquinolone has shown to be as effective as combination therapy utilizing topical antibiotics that are commercially available. But recent reports do not recommend this in view of more drug resistance. 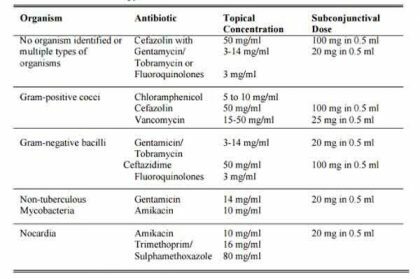 The following table gives the dosage schedule of commonly used antibacterial agents. Add 2 ml of injectable Gentamicin or Tobramycin to 5 ml commercial topical preparation in a sterile set up using disposable syringe. Add 5 ml or 10 ml of distilled water or sterile saline to 500 mg vial of cefazolin to obtain 10% or 5% solution. Use a dropper, which is available in the pharmacy or other source. Add 10 ml distilled water or saline to 500mg vial of Vancomycin and obtain a 5% solution. 1% would be sufficient. Add 10cc distilled water to 100mg of Amikacin. Use a sterile empty Xylocaine vial and place the cap for ready use. All these solutions could be safely used for a week. If it is applied frequently as recommended it will not last more than a week. The treatment of fungal keratitis remains as a challenge. All the available antifungal agents are fungistatic and not fungicidal. The penetration of the drugs is poor particularly when the epithelial defect is small. It leads to prolonged treatment, often leading to poor compliance with antifungal therapy. Natamycin (5%) and Amphotericin -B(0.15%-0.5%) are the most efficacious among the available topical antifungal agents against filamentous fungi. Voriconazole 1% is a recent addition in the treatment of filamentous fungi. A recently published randomized clinical trial demonstrated that the safety and efficacy of Natamycin and Voriconazole are comparable when used for fungal keratitis .Use of systemic antifungals like imidazoles and triazoles are reserved for deep keratitis associated with scleritis and endophthalmitis. The following table gives the dosage schedule of commonly used antifungal agents. Itraconazole – oral – 300 mg daily (only 55 to 60 % efficacy) Several clinical features suggest the response to antimicrobial therapy. Consolidation and sharper demarcation of the periphery of the stromal infiltrate. Decreased density of the stromal infiltrate. Reduction of stromal edema and endothelial inflammatory plaque. Topical therapy is tapered according to the clinical response, taking into account the baseline clinical picture and the virulence of the pathogen. Non healing or progressive ulcer inspite of adequate and appropriate anti microbial therapy, apart from all the points mentioned above. Apart from the regular history taking, care should be exercised to fully understand the treatment history of the patient, including all the medications along with the dosage schedules which were prescribed at the secondary centre. 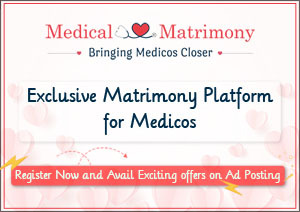 This will avoid unnecessary wastage of medicines and help in formulating an ideal treatment strategy. 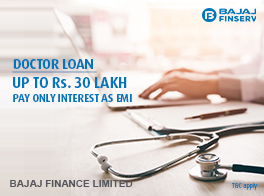 A fresh comprehensive clinical examination, as detailed in the previous section should be performed without being biased by the referral report. Microbiology: Since the patient has been referred for a potentially serious condition, a comprehensive microbiological evaluation including additional culture, antibiotic sensitivity testing and if necessary, a corneal biopsy should be performed. A repeat smear examination should be ordered for and carefully looked for mixed organisms. Routine culture examinations are useful for the following reasons. The cultures should be selected to identify common organisms like fungi and bacteria. An ideal minimal culture tests would use blood agar and Sabouraud’s dextrose agar. Special culture medial such as non nutrient agar should be reserved for non responsive cases or cases which show clinical suspicion of Acanthamoeba. Ocular bacterial cultures usually grow within 48 hours while the fungi from the ocular specimens grow within 7 days. Note: Acridine orange – GMS – if facilities available, use it. The treatment strategies should be revisited to check for adequacy, appropriateness and affordability. If the culture grew a different organism, then the treatment regimen should be modified appropriately as recommended in the previous table. If the ulcers continue to worsen in spite of correct treatment, then surgical options should be considered. Therapeutic keratoplasty has to be performed when the ulcer progresses despite specific anti-microbial therapy leading to descemetocele or perforation. The microperforation could be diagnosed by noticing a decrease in the size of the hypopyon, radial folds from the base of the ulcer and relief from pain. Sometimes it may seal spontaneously and healing will be faster. If the anterior chamber is formed within 48 hours with bandage or other supportive therapy therapeutic keratoplasty could be avoided or postponed. The goals of the therapeutic keratoplasty are to eliminate the infection and restore the integrity of the globe. The size of the graft should be decided on the basis of the size of the ulcer and should include the infected edges. Fresh donor corneas give better results in Phakic eyes. Steroid in any form should be avoided post operatively in fungal ulcers. If the patient requires only modification of the topical antibiotics, then he/she can be treated as outpatients. Plan treatment guidelines and perform surgery if necessary. Topical steroid uses is a menace in corneal ulcer. Patients go to medical shops & they give steroids for the red eye. Steroids drops should be banned as OTC drug.